Creative Halloween Craft Ideas for Kids! Halloween marks the start of fall and also the holiday season. It is such a fun and exciting time especially for the kiddos! With all the fun themes, characters, and symbols that go along with Halloween there are opportunities for so many creative halloween craft ideas! With the weather cooling down crafts are fun ways to keep the kids entertained inside the house! Crafts are also a great way to bring the whole family together for some bonding! Here are 5 Fun & Creative Halloween Craft Ideas to do with kid’s! – Use white paint and an upside down foot or hand on black paper to make a ghost! – Use a fisted hand dipped in orange paint to make the perfect pumpkin! 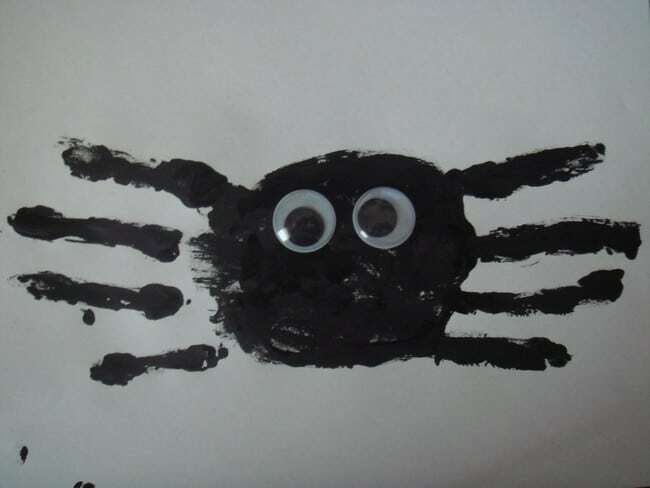 – Use black paint and both hands to make spiders or bats, your fingers will be the legs/wings! – Use yellow, white, & orange paint to make stripes on the hand and it will look just like candy corn! After the paint dries you can go back and use markers & crayons to add details, such as faces & stems! First collect a group of gallon milk jugs and clean them out. Next use a black marker to draw a spooky ghost face on the front of the jug. Cut the back side of the jugs off, Line the jugs up outside or in a window. 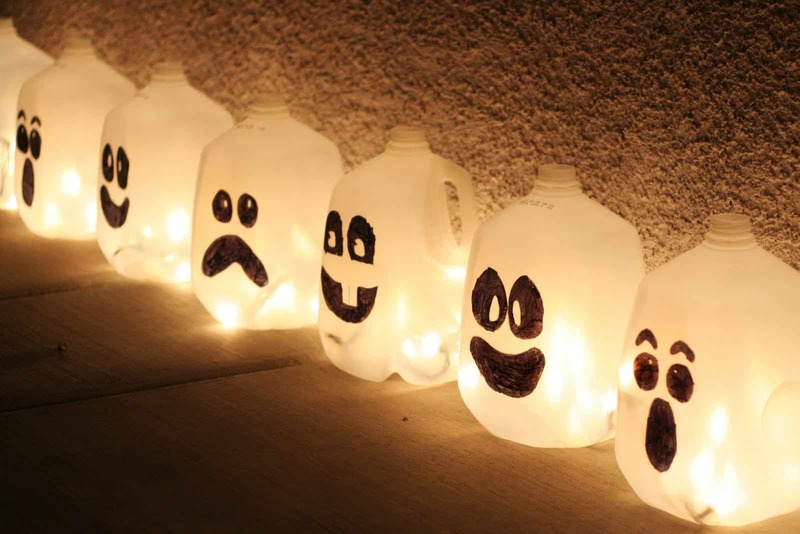 Lastly use a string of lights and place them in the openings in the back of the jugs. This project looks great especially when it gets dark. 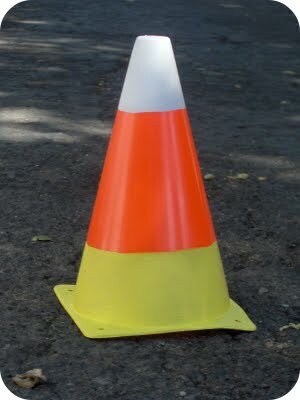 You can find miniature traffic cones at Wal-Mart or dollar stores for pretty cheap. Since they are already orange and shaped like candy corn all that has to be done is adding the yellow and white! You can do this numerous ways rather its paint or colored tape. These candy corn pieces will look great around the house or in the front yard! Carving pumpkins is a great tradition and super fun. However it can be dangerous for kids to do on their own. An alternative that gets the kids involved and allows them to show off their creativity is painting the pumpkins! 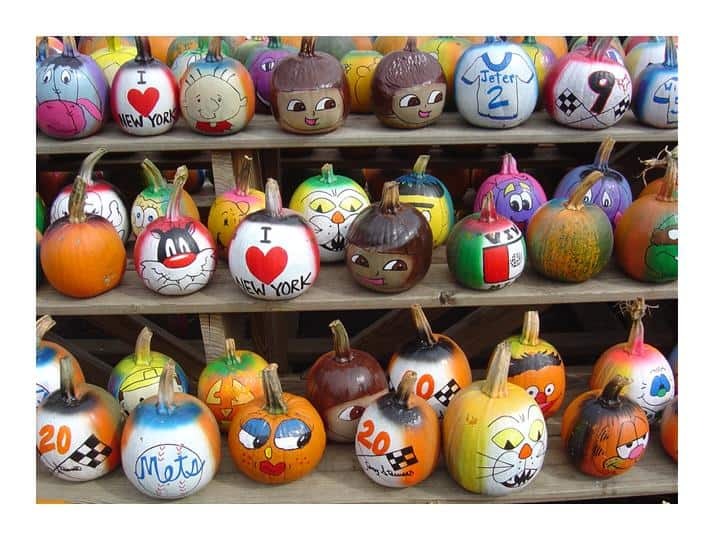 With different colored paints and decorations you can paint a pumpkin into almost anything. Halloween characters such as Frankenstein or a witch, your child’s favorite character, animals, or just a silly face! You can add more detail by gluing on googly eyes, rhinestones, & hair! This is a fun project the kids will LOVE! Treat bags are always popular at Halloween. Rather you are passing them out to trick or treaters or making them for the kids Halloween parties, candy and snacks seem to be essential. 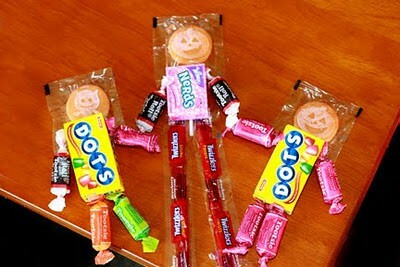 Here a few fun creative ideas for treat bags! This is such a simple and cute idea that kids will absolutely love! Not only do they get to help assemble the people, but they also get to play with them like a toy, and eventually eat the candy. What you will need is a glue gun and some assorted candies. Use a pumpkin lollipop for the head, boxed candies such as nerds or dots for the body, and long, skinny candies such as tootsie rolls, smarties, and twizzlers for the arms and legs! This is a simple Halloween treat that the kids will really get a kick out of! Get a box of disposable plastic gloves and drop a piece for candy corn in each finger hole as the finger nails. Then stuff each glove with popcorn and tie the bag closed with something like a trash bag tie. 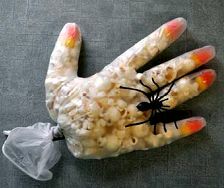 To add more detail to the treat get a pack of plastic spider rings from the dollar store and place them outside on the fingers! Decorated Trick or Treat Sacks! When trick or treating kids will need something to carry their candy in so why not make it into a fun activity. Making their own bags is a great way to get in the Halloween spirit and express their creativity. You will need some sort of blank container rather it’s a plastic bucket, a felt bag, or just a paper bag with a handle. For decorating you will need markers, crayons, paint, various decorations, any craft supplies you think will be fun to use. 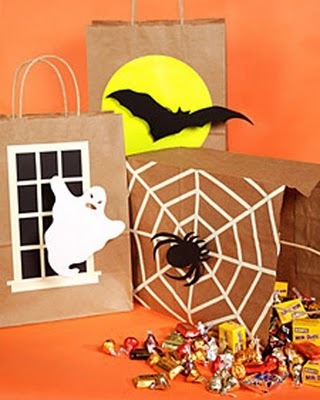 Spread all the supplies out on a big table and let the kids decorate their bag however they want rather its Halloween themed or made to go along with their costume they are sure to have a blast! Previous story Falling Gracefully With the Autumn Leaves.